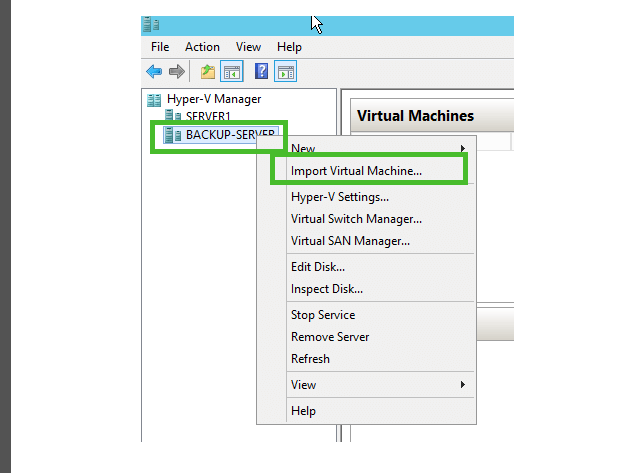 How to Export and Import VM in Hyper-V? You can use import and export option, when you wish to create a new virtual machine with same configuration and setting of an existing machine in Hyper-V.
Once you export virtual machine files, they will save in the server and you can easily use or reuse those files as many times as you want to create Virtual Machines. Machine initiates new security ID (SID) from the machine files. This can help us in future to clone multiple number of virtual machines without any difficulty in the same network. 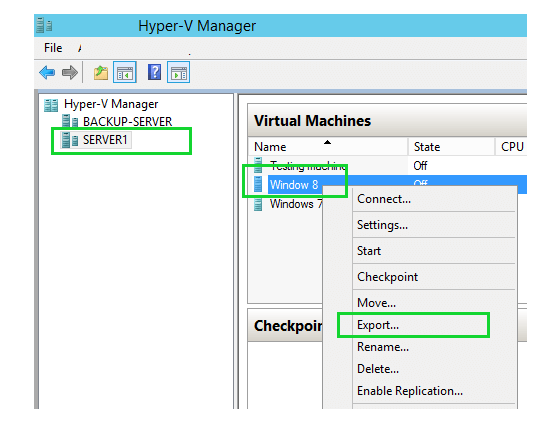 Connect to your server Hyper-V from Hyper-V Manager, press right click on your virtual machine and choose the export option. 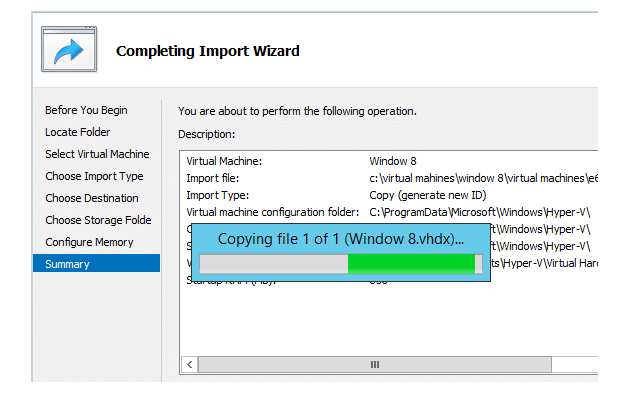 In this wizard, we are going to export Windows 8 based virtual machine from Hyper-V server. On this step you need to define the path to export virtual machine. Once you define the folder path , export process with initiate. Note: You can export virtual machine when it is in on mode. Once you complete the export process, you can find the virtual machine (VM) files in destination folder. This folder will include everything containing Snapshots, Virtual Disks as well as Virtual machine files. If you want to import the VM, you have to copy all these three files to the server. Before you start with importing process, you need to copy the imported VM files and folders to your local server. Here in the wizard we are going to import a Windows 8 Virtual machine (VM) to server 1 to a backup-server. Prior importing virtual machine, we have copied Windows 8 exported virtual machine files and folders from Server 1 to backup-server. Connect Hyper-V, hypervisor from Hyper-V manager, Press right click from your mouse on Hyper-V server and hit Import Virtual Machine Option. Hit next button on the import virtual machine page. Once you select the path of VM folder, it will display the machine in the import virtual machine page. Choose machine and hit next button. Choose the import mode based on your need, it is important to note that exported folders can be repurposed to clone machine only utilizing “Copy the virtual machine (VM” option. Choose the VM storage area path to store VM files and folders. Take the regular values in this section. If you wish to change the area, check the Store the virtual machine in a different location option. Choose the folder path to store VM hard disk. This is a location to store your VPS Hosting machine. Re-evaluate the configuration section of your machine and hit Finish button to complete the import process. Review your machine configuration selection, and click on Finish to finish the import process. Need more help? Contact our 24/7 Expert support team today via, live chat, email, phone and ticket system.